This October was the second wettest in the 7 year operation of Canebas Weather Station. It was only topped by the extreme rains caused by Typhoon Melor in 2009. We received 5.21" (132mm) of rain which is 380% of a normal October. It was sufficient rain to almost reach the cumulative totals expected for the end of November! At the moment the forecasts aren't looking so favorable for November, but long term forecasting remains more an illusion than a science. Only time will tell. So for the moment it is very much "touch and go" for Northern California at least. Thanks for the report. We have had more snow in October and November than we has been the case in the 9 years of my weather station installation. These are the same storms that are into your area. Keep sending them. 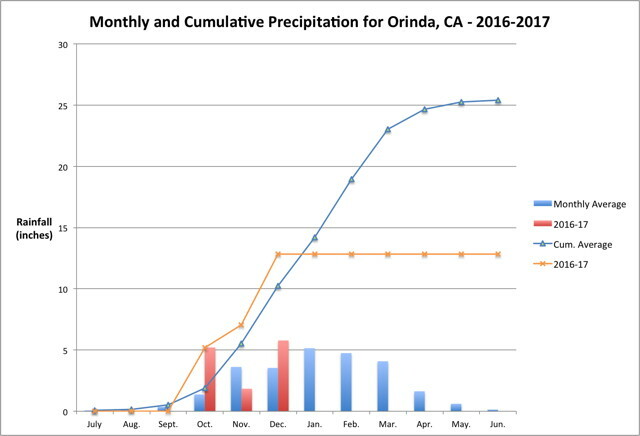 Thus far, this rainy season we are at 125% of normal through December 31st. 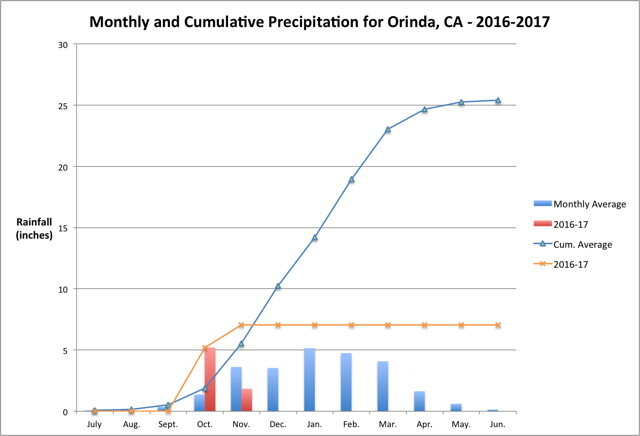 As you can see from the graph we have already received more rainfall than we normally expect for the entire rainy season! January brought 246% of what normally falls this month. 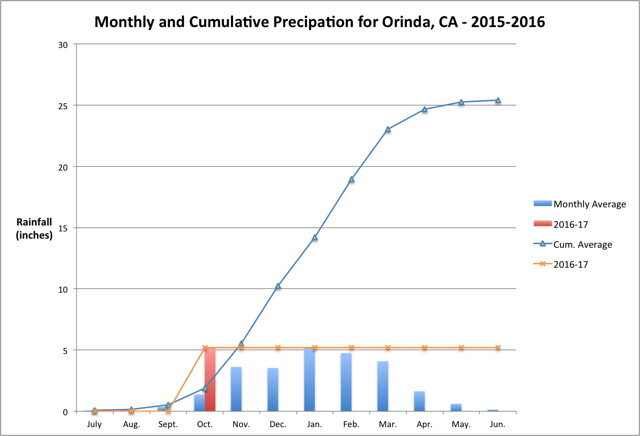 As a result, we have 180% of the rainfall we would expect to have through the end of January for the season. Fairly strong indications that the next round of widespread rain will be it for awhile. The outlook for all of next week is for warmer than normal temperatures with drier than normal conditions as the ridge rebuilds back into the southwest Conus. The Climate Prediction Center is less pessimistic with normal conditions expected for Northern California on the 6-10 day, 8-14 day, and experimental week 3-4 outlook. Nice while it lasted. We set a record here with 10 feet of snow in January, containing almost 5 inches of water. 4 months into the water year and we are more than half way to the annual average. It's been a good winter for water in most of the West, so far. Wow, that's a lot drier than I'd have expected. That's only a ratio of about 4%. Ours is typically in the 10-20% range for our wet, sloppy snow. Our snow here is usually powder, with only a couple of wet storms each winter. The state ski industry calls it the Greatest Snow on Earth. On average we run about 12% in terms of the water to snow ratio. Well, that gloomy bit of forecast discussion has turned gloomy of the opposite variety. Instead of 1 storm we are getting at least 2 perhaps 3 and once more there will be an atmospheric river tap that could bring once more a lot of rain. So Northern California is once more staring at potential flooding problems. Even the Climate Prediction Center is forecasting above normal rainfall in the 6-10 outlook. However the 8-14 day outlook puts Northern California at the edge of below normal rainfall. 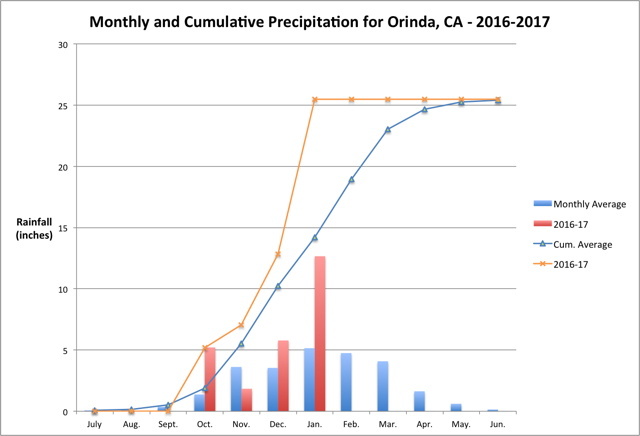 Edouard -- How do you create that beautiful chart ("Monthly and Cumulative Precipitation for Orinda, CA - 2016-2017")? I'd love to make one showing the precipitation in our area. Dear Grand and WeatherCat infomaniacs, . . .
. . . . . Oh da' shame!! I won't be able to show my face in public no mor' . . . . . . .
Actually, I just created a simple Excel spreadsheet and used its graphing capabilities. Since I process the numbers manually at the end of each month, this works just fine for me. I can send you the spreadsheet, but it is truly just a quick and dirty set of tables. If you have access to Excel or equivalent, you might be better off to start of scratch and avoid my clumsiness! Actually, I just created a simple Excel spreadsheet and used its graphing capabilities. Dear Grand and WeatherCat tinkers who have forgotten why they bothered . . . . . I use Excel too, but I don't know how to embed a bar chart in a line chart like you did. . . . . So you think I still remember after all these years?!?!?? . . . .
. . . . Remember!! You're Askin' for it!! . . . . Enjoy! or grumble or something . . . . . . . The "trick" is to create a line chart for all the data. Select the line you want to change to a bar chart, control-click it and select "Change Series Chart Type..." Select a bar chart type. That's it!